The LISA (Laser Interferometer Space Antenna) Pathfinder is a research spacecraft of the European Space Agency (ESA) and was launched in December 2015. 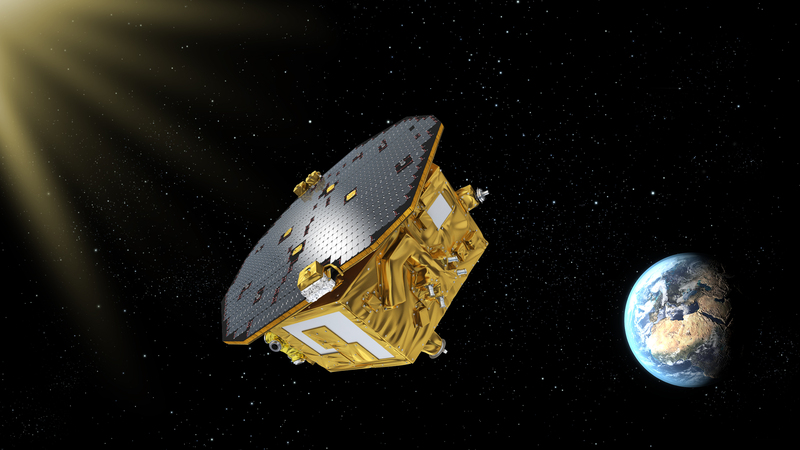 The main purpose of the LISA Pathfinder mission is to test certain technologies for future space observatories to detect gravitational waves from large astronomical bodies (e.g. stars) around us. Visualization of the LISA Pathfinder spacecraft in space. The LISA Pathfinder uses extremely sophisticated technology to observe the “path” taken by two cubes located in the heart of the spacecraft when subjected to pure gravitational free-fall. It is also ensured that the cubes act under the influence of gravity alone and hence, the LISA Pathfinder shields these two cubes from external disturbances like solar wind and/or pressure. Therefore, you have two cubes in pure gravitational free-fall inside a spacecraft that not only measures the path of these cubes and protects them from noise, but also moves with the specimen without any contact at all. The LISA Pathfinder arrived at its operational location late January 2016 and began its scientific mission in March 2016. The following 2 months of operations have shown that the LISA Pathfinder can measure the relative movement of the two test masses with a precision that is five times better than expected by the LISA Pathfinder team. Additionally, both the test masses are also motionless with respect to each other with a relative acceleration of less than 1 part in ten millionths of a billionth of Earth’s gravity. Being a ‘proof of concept’ mission, the LISA Pathfinder has successfully demonstrated key technologies that are essential to building a gravitational wave observatory in space. Due to launch in 2030s, the eLISA will be a space observatory capable of detecting displacements of the order of fractions of a picometer. This could allow us to “see” the very early universe (perhaps even the Big Bang) through this new window into the cosmos: G-wave astronomy.